The weather here in the Boise foothills has been crazy the last few days. Snow, rain, two or three hail storms per day, and sunny in between. The kids and I haven't been able to get out much and cabin fever is setting in. Mrs. Idaho_Birder is off on a ladies weekend in Portland, seeing and photographing birds that I have never before seen, that she only cares a bit about because she can rub it in. 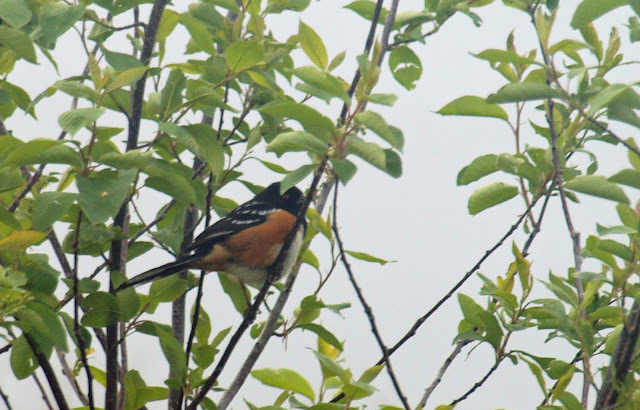 I've been anxious for the return of Lazuli Buntings and Bullock's Orioles to Avimor, but the weather has kept them away and me and kids mostly indoors. I did get some first of year and first-ever yard birds which I was able to photo-document. The picture were through the dirty glass of my windows, so are not as polished as I would prefer to post, but you'll get the idea. Rufous Hummingbird - now this could in fact be another Calliope, but a few traits point me toward Rufous. First, the amount of orange color on the flanks. Calliope's may have some of this, but this bird shows more orange/rufous color than buffy like a Calliope would. The angle doesn't show the tail too well, but it seems longer than the Calliope. I'm open to correction here. Spotted Towhee - these are fairly regular here in my neighborhood of Avimor, but this was the first to visit my yard. It foraged on the ground along with the Mourning Doves, California Quail, White-crowned Sparrows, Red-winged Blackbirds, and one remaining Dark-eyed Junco. When all my kids had seen it and I had the camera ready, it jumped up into our tree where it was harder to get a clean shot. Still, always fun to have a new yard bird! Idaho Birder, great shot of the male calliope! I have only seen the female so this is a real treat. I often shoot through the windows of my house. Sometimes my photos are foggy but when I sharpen and brighten them on the computer it really helps. I get shots that I wouldn't get any other way, so, way to go!. Congrats on the towhee. I do think it is always exciting to get a new yard bird. My most recent yard bird was the black-chinned sparrow. I noticed the change in your blog name. any reason? Have fun with those kids! Idaho birder, I think the new name suits your blog and will help people know what the focus of your blog is. Idaho is a great place and my one fear is that too many people will discover that and love it to death! I have responded to the rest of your comment on my blog. Great photos and I love the hummingbirds. Great photos and post. I am looking forward to you coming to Camas late in May. Yesterday I visited Market Lake and identified 41 species including a dunlin and a Cinnamon/Blue-winged teal cross. Beautiful bird.